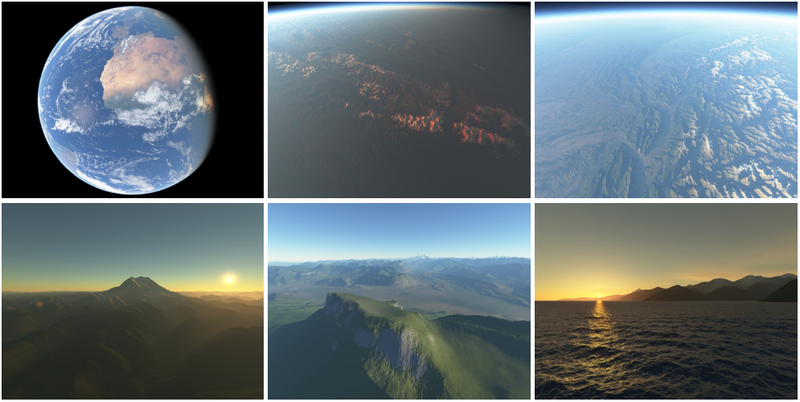 In this context, the subject of this thesis is to propose, implement and evaluate real-time procedural animation models for clouds at all scales, from individual clouds to large cloud systems at the planetary scale. The goal is not to perform exact simulations, but only to get plausible shapes, distributions and animations. Moreover, we want to have high-level handles that a user could control on desire. Earth is large and the viewer can visit any location, so we need scalable approaches, which do not compute and store everything, and which adapt to visibility and distance. At small scale (kilometers) the goal is to reproduce, in particular, the rising of thermals and the formation of cloud puffs, accounting for thermodynamics, phase changes, and local fluid circulation ("small scale" means clouds seen from short distances, not a small domain: animating clouds at this scale should be possible anywhere on Earth). At medium scale (dozens of kilometers) the goal is to reproduce the effects of topography, winds and self-organizing patterns on the distribution and type of clouds. (Typical patterns are Benard cells, trails, etc). Finally, at large scale (Earth), the goal is to reproduce the motion of air masses and fronts, resulting from large scale patterns like Anticlones/Cyclones, Hadley cells, etc. Theses 3 scales are largely decoupled, and allow to visit various aspects of Computer Graphics (simplified physical simulation, pattern generation, vectorial animation). They can be studied independently, then the connections and transitions investigated. For this, new representations and algorithms have to be invented, from existing tools in Computer Graphics, or directly inspired from the high level knowledge of physics and meteorology literature.